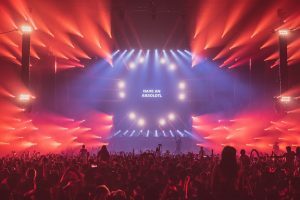 The biggest Transmission dance event to date – in terms of audience numbers AND Robe moving lights – was staged at Sydney Showground in Australia, where thousands of fans absorbed the great vibes and music of “The Awakening” plus some truly phenomenal visuals courtesy of lighting designer Bas Kemper and the Vision Impossible collective. Over 200 Robe moving lights – 78 x Pointes, 90 x MegaPointes, 10 x Spiiders, 20 x LEDBeam150s and 19 x BMFL Blades – on the rig ensured that this replicated the seminal moments of the ‘Awakening’ cycle which started in the O2 Arena in Transmission’s ‘home’ city of Prague, Czech Republic last October… and was another truly memorable visual extravaganza of epic proportions! 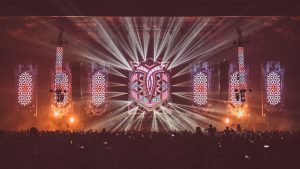 Transmissions originators, United Music, worked closely with local promoters Symbiotic, whose Janette Bishara and Richard McNeil understood the importance of recreating the defining spirit and essence of Transmission Prague, and went all-out to ensure the 2019 Australian event provided the same awesome production values. The Robe presence at Transmission had started seriously at the 2017 Prague event, with 24 x MegaPointes on Bas’s design. The fixture had just been launched then! The 2018 Prague edition – which kicked off the ‘Awakening’ cycle – was delivered with 98 x Robe fixtures, so Bas and his core programming / operating team of Zis Ankone and Martijn Deenen, both also from the Netherlands like Bas, were delighted when the spec for Australia came through offering over 200 Robes. These and all the other lighting for the show were supplied by leading lighting rental company, MPH Australia. The Melbourne based company has one of the largest inventories of Robe in the country. MPH’s Matt Hansen was the event’s lighting production manager and Mike Parsons was the lighting crew chief. The idea was to replicate as far as possible the ‘hi-impact ‘Awakening’ production and visual design which had been such a success at the O2 Arena in Prague. The shape of the room in Sydney was completely different. It was a lot wider, with around 8 metres less headroom, so they scaled and re-formatted the design, including the detailed and elaborate custom Awakening set and scenic cloths together with seven video elements so it would work in the new space. A large hexagonal LED screen presided centre stage, flanked by six smaller vertically ‘stretched’ hexagonal pods rigged across the width of the stage, with lights positioned in between and around all of these and also over the auditorium roof. Out in the auditorium were six columns of LED flown above the audience which were also rigged with lights like Prague. The 78 x Pointes were used on the main hexagon and in the pods and also on the vertical trussing above the audience. Positioned thus, they worked together to produce an infinite variety of fabulous looking scenes that enveloped the whole room. The MegaPointes were the main fixtures onstage, used for all the high impact factors, WOW looks and retinal burn-outs! The Spiiders were carefully positioned to provide DJ back-lighting, and for extra effects from individual pixel and ring looks during some of the timecoded numbers. The LEDBeam 100s highlighted and expanded the decoration and augmented the aerial looks created with the Pointes and MegaPointes. The BMFL Blades were all focussed on lighting the décor and scenic elements as well as key lighting for the DJ positions and backlighting for the dancers. All the fixtures were originally chosen by Bas, together with some substitutions for the Sydney show, a task which Zis co-ordinated. Zis loves Pointes for their “all-round variety and functionality”. Utilising them to the max, he created ‘structural scenery’ for the massive wide aerial looks that characterised this Transmission Australia edition. Like many, he thinks MegaPointes are great for the brightness, small size and diversity of looks they can bring to any setting. He finds them perfect for trance music events which need to look scenic but also have a full-on rawness and punch to suit the music. “From tight, heavy beams to wide angle looks, and also in combination with standard Pointes, MegaPointes are a joy to work with” he stated. He appreciates the intensity of the tight beam when the Spiiders are fully zoomed in, an effect used to back light the DJs and enhance the stage depth. Even in the vast Showground venue, Zis remarks that the little LEDBeam100s really ‘popped’ and were instantly visible in all the photos. The power and accurate shuttering of the BMFL Blades was harnessed to enhance the extensive décor elements and to help create a spacey vibe that both contrasted and run in conjunction with the screen visuals. As the lighting and general production design followed the architectural lines of the building so closely, getting the symmetry right to accentuate the shape of the space was vital to all the technical elements looking their best, and the end results showed the dynamics and integrity of Bas’s original ‘Awakening’ design. Lighting was run via two grandMA2 consoles at FOH and a grandMA2 light for backup. Zis notes that it was an excellent experience working on site with the team from MPH. The lighting rig proved extremely reliable and the process was efficient and streamlined. “The quality of the Robe fixtures really came across on this project” he commented. “Combined with a great atmosphere, we could make the whole arena massive and overwhelming or close things right down, so it became a close and intimate space as the mood directed”. 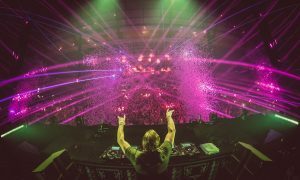 A fantastic line-up included performances from Above & Beyond, Marlo, Vini Vici, Ilan Bluestone, AVAO, Vision Impossible, Marcus Santoro, Sander van Doorn presenting Purple Haze, MarLo, Simon Patterson and many more. 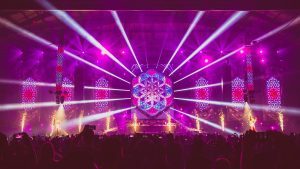 Transmission’s own production manager was Cyril Horanek and their visual show direction was by Vision Impossible, with SFX by AVM SFX and lasers operated by Ministry SK from Slovakia. Dancers, choreography and costume design was co-ordinated by Marina Stepanenko and Tereza Lojkaskova. Pyro for Transmission Australia ‘The Awakening’ was delivered by Foti fireworks, staging by Stagekings Australia, the video supplier was Mediatec AP, sound was from Sydney based JPJ Audio and the laser hardware came from Lumina Visual Productions.